Turn your home into a sonorous avian sanctuary with our delightful Singing Bird Clock: At the top of each hour, a different North American species sings its song! An authentic recording of an American robin plays at 1:00, a black-capped chickadee at 4:00, a purple martin at 8:00…and a bald eagle rings in the 12:00 hour. (A light sensor deactivates the sound when the room is dark.) 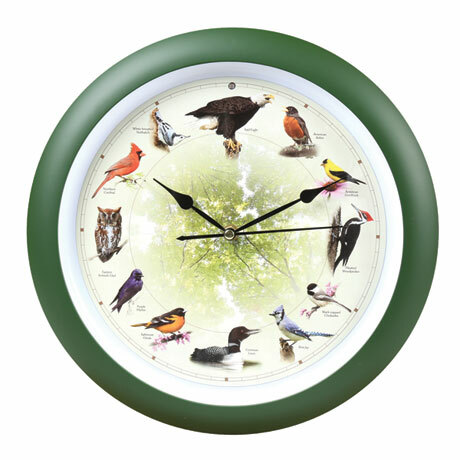 Images of the birds decorate the clock face, which is framed in hunter green and comes ready to hang or stand. Choose from 8" or 13" diameter. Requires 3 AA batteries (not included).